Amanda Vilensky and Igor DeMoraes receive their scholarship checks. Tata & Howard, Inc., a leading innovator in water, wastewater, stormwater, and environmental services engineering solutions, announced it’s 2018 Donald J. Tata Engineering Scholarship winners. 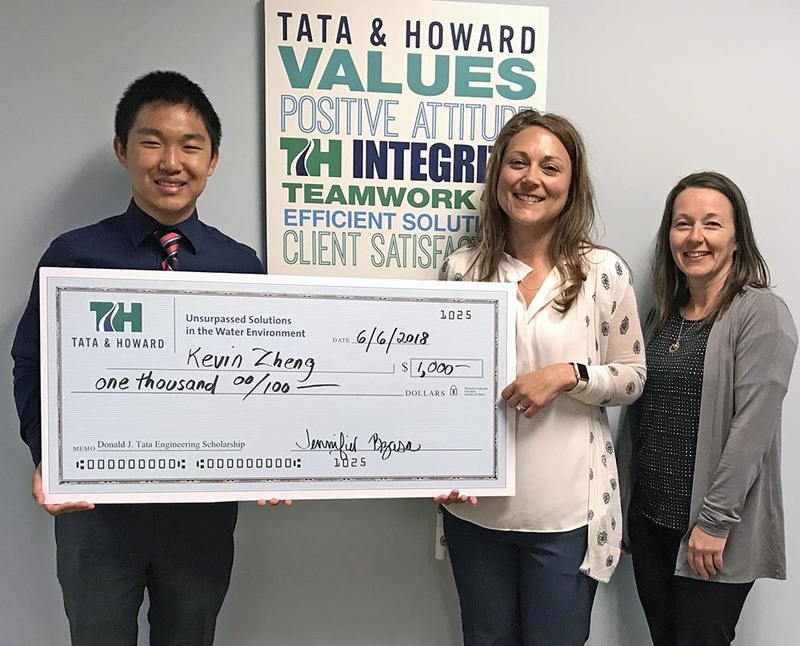 Graduating seniors from Marlborough High School, Igor De Moraes and Amanda Vilensky; and seniors from Natick High School, Kevin Zheng and Rebecca McCue, each received the $1,000 scholarship sponsored by Tata & Howard and the Tata family. This annual scholarship was instituted in memory of Donald J. Tata, P.E., co-founder and former CEO of Tata & Howard, Inc., who passed away in March of 2017. 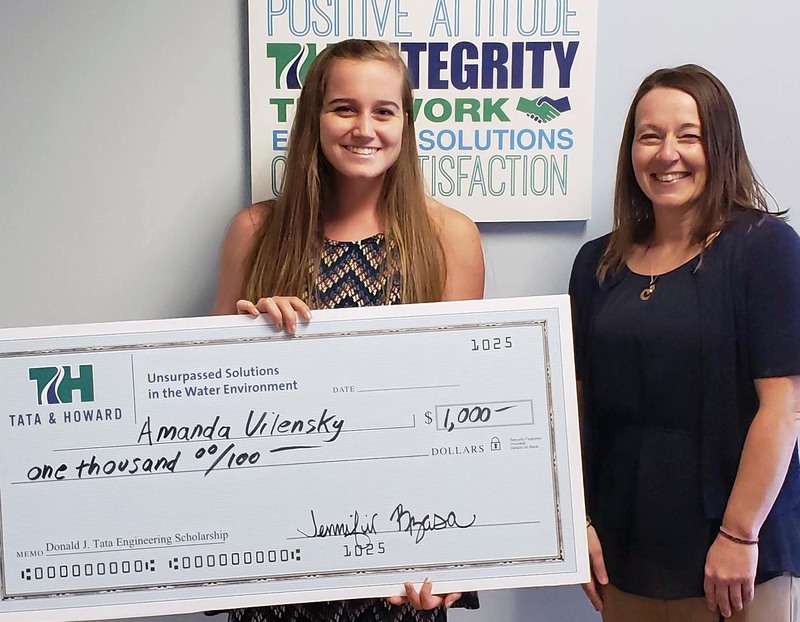 The scholarship which is valued at $1,000, is presented to a graduating Marlborough High School senior who is attending a four-year college or university to pursue a degree in engineering. This year for the first time, the scholarship was expanded to include Natick High School graduates, Mr. Tata’s hometown for over 30-years. Kevin Zheng, an AP Scholar with Distinction, graduated from Natick High School with highest honors and participated in numerous unique extracurricular activities. One notable activity was to create the largest Stick Bomb with a group of friends, that was ultimately held by the Guinness Book World Records. He facilitated engineering and computer science activities to thousands of daily visitors at the Museum of Science in Boston and was recognized by both houses in the Massachusetts State Legislator on the topic of Saving Energy. Mr. Zheng plans to attend Commonwealth Honors College at the University of Massachusetts, majoring in computer engineering. A member of the National Honor Society, Rebecca McCue also excelled at tennis and volleyball. She was a member of the Key Club, who volunteered at several community service projects, which included building projects for disadvantaged Appalachian families in West Virginia. Ms. McCue participated in Physics for Engineers, a year-long course for seniors, that are self-motivated and have a strong background in math and science. She plans to study Environmental Engineering. Amanda Vilensky, a member of both the National Honor and the National Art Honor Societies, is an accomplished student and artist. Through her work with the Environmental Club at school, she developed a passion for engineering and its problem-solving methodology for critical ecological issues. Ms. Vilensky plans to attend the University of Vermont to further her education in Environmental Engineering. 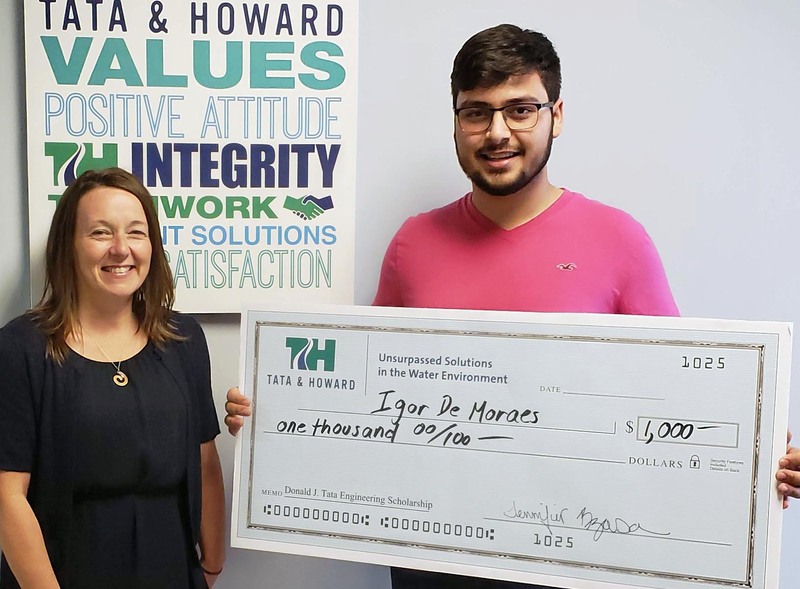 Fluent in both English and Portuguese, Igor De Moraes is a member of the National Honor Society and a STEMbassador, who mentored other students in Math and Science. A curiosity in renewable energy encouraged him to hypothetically experiment with piezoelectric tiles for the school’s gymnasium to produce electricity. Mr. De Moraes is a gifted athlete, excelling in football, track, and competed in Ping Pong competitions. He was also an officer in the Latin Club. Studying Mechanical Engineering, Mr. De Moraes will attend Worcester Polytechnic Institute in the fall. Founded in 1992, Tata & Howard, Inc. is a 100% employee-owned water, wastewater, stormwater, and environmental services consulting engineering firm dedicated to consistently delivering cost-effective, innovative solutions in the water environment. Tata & Howard has gained a solid reputation as an industry leader in the Northeast by bringing knowledge, integrity, and dedicated service to all sized markets, both public and private. With offices in Massachusetts, Connecticut, Maine, New Hampshire, Vermont, Arizona, Texas, and Ontario, Canada, Tata & Howard’s expansion has included projects in Louisiana, New Mexico, New York, Pennsylvania, and Brampton, Ontario.